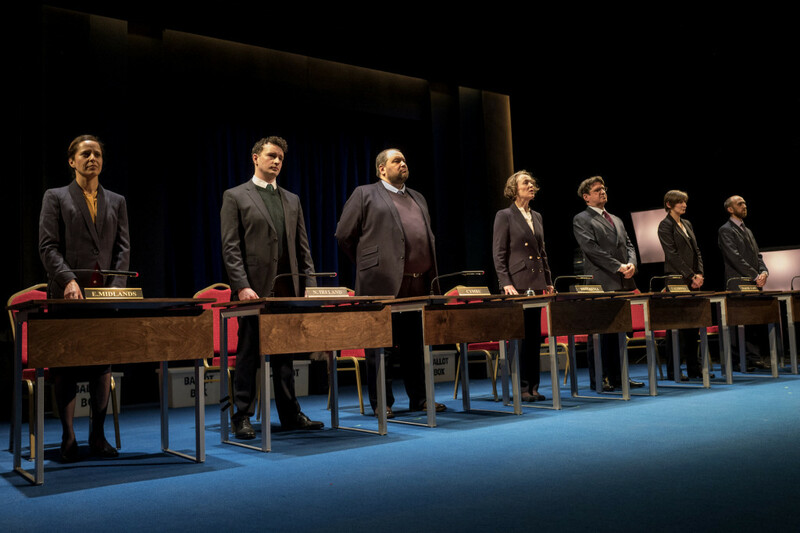 A `Sacrament of Listening’ could be the subtitle for Carol Ann Duffy and Rufus Norris’s post-Brexit project that opened three months ago at the National and which, caught now at the end of its UK tour with it’s almost white cast and similar audience, sits so oddly in a theatre normally packed with multi races and ownership. What does that tell us in itself – or did I just catch it on a particular night? As my companion wisely noted, from the regions summoned – Caledonia, the North East, Northern Ireland, Cymru, the East Midlands and the South West – the one outstanding omission was London. 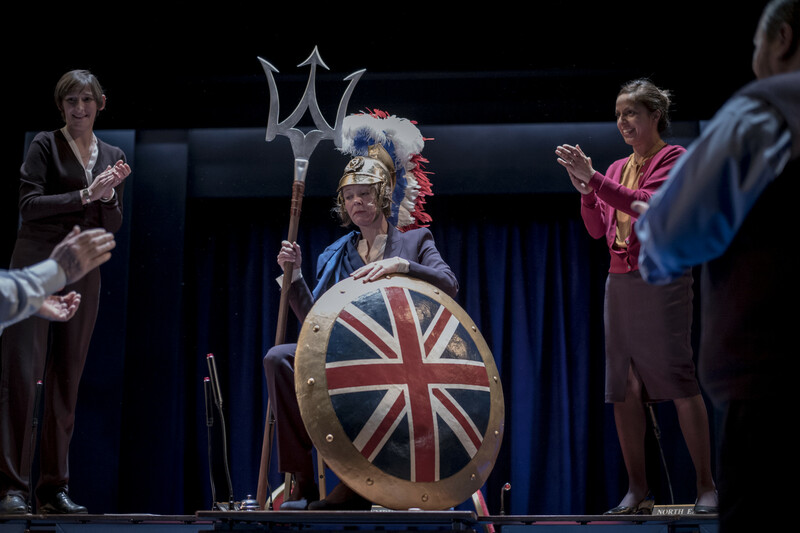 Had the capital, which voted overwhelmingly to Remain, been included the voices heard, the audience, and maybe even the cast might all have looked very different. 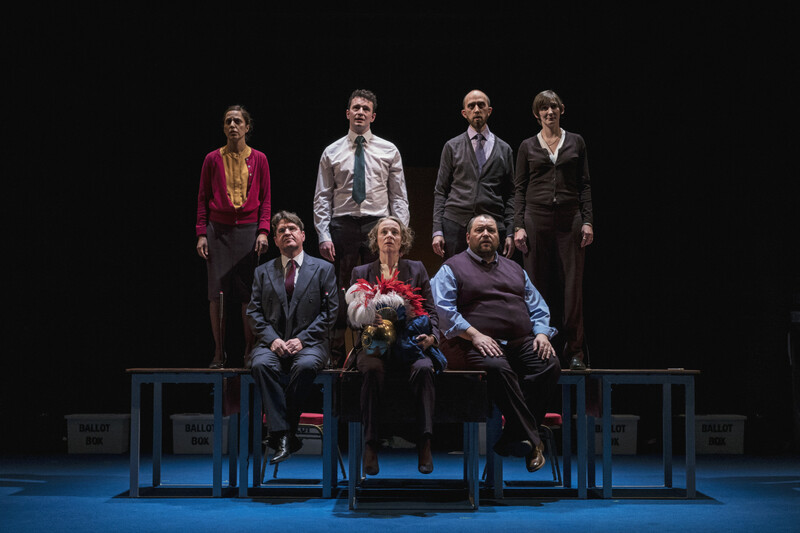 As it is, this is, as Carol Ann Duffy and Rufus Norris both describe it, `a work in progress’ – an ongoing process, a look more at those who voted to Leave the EU. It is also very much, in their hands a reminder of this island – and her personification, Britannia – longevity and how, once again, twisting this way and that, she may be, as she has done down the millennia, be in the throes of evolving into something else. The National’s programme, as ever a gold-mine of information, notes that we were once, 8000 or so years ago, a peninsula, land-tied to Europe. Only warming ice caps (again!) sundered us whilst a fatal tsunami added to the fissure. Now a sloppy referendum has widened the gap even further. To their great credit the National and Norris set out to find how perhaps this came about. The result, My Country, is both an epitaph and a calling together, a patchwork of voices articulating personal, highly regional views and feelings with Duffy as if grieving for a child, pouring out a maternal plea for reconciliation. Jo Cox’s culminating quote, `we have far more in common than divides us,’ was never more apt. Or heartfelt. 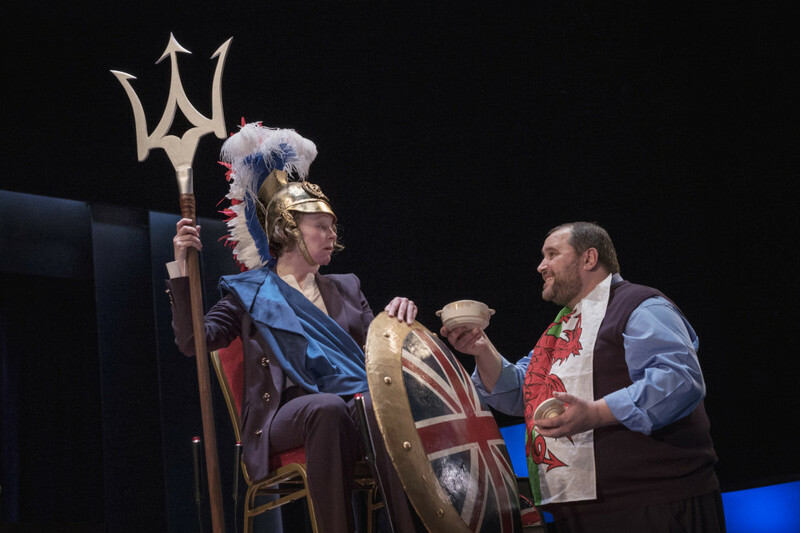 There is much humour here, too, as Norris manoeuvres his cast around, pinpointing regional particularities and interspersed with Penny Layden (bearing an amazing resemblance to the journalist and campaigner, Beatrix Campbell) as Britannia quoting from the Westminster gang – Cameron, Boris Johnson, Gove and arch Brexit henchman, Farage. Some have criticised the production for expressing too much pro-Brexit sentiment. But surely in a `Sacrament of Listening’, the whole point is to listen to views other than the usual `liberal consensus’ that theatre tends to lean towards. And the creators here seem particularly to have tried to understand and capture voices from disaffected white Brexiteers. My only and main caveat with the production would be the breakneck speed at which it’s delivered making absorption of the material even, and despite the captioning, a frustrating business. But I hope the production’s subtitle, `work in progress’ is just that. And that Norris and Duffy and their band of interviewers and collaborators at theatres up and down the country continue further to sound out and record the feelings and views of our countrymen and women as a beautiful and important contribution to our democracy and national conversation. Moments of special joy: Layden’s Britannia being brought comfort by sweet Welsh anthem, Cavan Clarke breaking into Irish dancing, Duffy’s poems and Layden’s final `I have loved you all’ with a plea to make it our individual responsibility to `search and strive for good leadership’. First perf in the Dorfman Theatre at the National Theatre, Feb 28, 2017 then touring in UK and Holland from Mar 27-July 1, 2017. First perf at Theatre Royal Stratford East, London, June 19, 2017. Ends run at Stratford East, June 24, 2017. This entry was posted in 2017, Reviews and tagged Britannia, Carol Ann Duffy, National Theatre, post-Brexit analysis, regional voices, Rufus Norris, Theatre Royal Stratford East on June 23, 2017 by Carole Woddis.